According to sources to meet TNFC requirements one “Anka” Block-B UAV System, consisting of three air vehicles, payloads and related ground segment systems, was leased by the SSM. The “Anka” Block-B UAV System is serving the TNFC under a long-term leasing contract and as of May 7, 2018 there are only two air vehicles in the service and the third one would be delivered to the TNFC soon. The first two “Anka” Block-B UAVs are equipped with the L3 Wescam CMX-15D FLIR payload, but the third air vehicle will also have unique developed Aselsan’s SARPER Synthetic Aperture Radar (SAR) payload in addition to CMX-15D. L3 Wescam’s CMX-15D has been preferred by the TNFC. According to sources since Aselsan’s CATS HD Electro-Optical (EO/IR) Reconnaissance, Surveillance and Targeting System is not ready to meet all of the end user’s requirements and StarSAFIRE 380-HLD of FLIR Systems could not be procured from the US due to ITAR regulations, L3 Wescam’s CMX-15D is preferred by the Turkish Naval Forces Command. Contrary to the 118kg weight of Aselsan’s AselFLIR-300T the CMX-15D weighs only 51.4kg. Aselsan’s CATS, on the other hand, has a weight of 59kg. 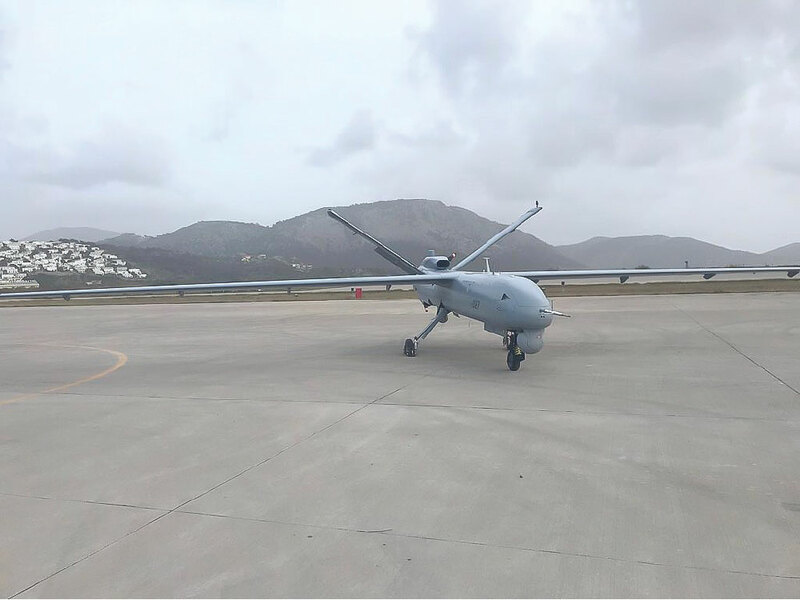 Deployed at Dalaman Naval Airbase the “Anka” Block-B UAV performed its first operational flight on March 27, 2018 over the Aegean Sea. According to the leasing contract TAI personnel deployed at Dalaman Naval Airbase are only responsible for flight (the take-off, flight and landing) and maintenance services but the payload (CMX-15D and SARPER) is fully under the control of TNFC personnel. Thanks to its long endurance and relay mode capability (able to extent existing LoS range) with a single sortie “Anka” Block-B UAV is able to cover the whole Aegean Sea. “Anka” Block-B can operate at a distance of up to 250km with line-of-sight (LoS) communications. Thanks to its GMTI/ISAR modes supporting both maritime and land surveillance the 80 kg (around 100kg with radome) SARPER SAR payload provides high resolution SAR/GMTI imagery even at cloudy weathers at a standoff range up to 40km and ISAR imagery at Maritime Surveillance Radar mode up to 70km. TNFC is planning to procure up to 12 “Anka” UAVs either in Block-B or in Block-S (negotiations for “Anka-S” is on-going) configuration, to be equipped with a FLIR payload and Aselsan’s SARPER SAR payloads and further 10 “Bayraktar” TB2-S Armed UAVs. Designed, developed and produced by Turkish Aerospace Industries (TAI) under the Turkish UAV Development (TIHA/TUAV) Project, the “Anka” is a combat proven Medium Altitude Long Endurance (MALE) Class, UAV System. The “Anka” Block-B, upgraded and lightened version of Block-A aircraft, is 160kg lighter than the first “Anka” prototype and 100kg lighter than the “Anka” Block-A aircraft. Having a service ceiling of 30.000ft the “Anka” Block-B UAV has an endurance of 18 hours at 23.00ft mission altitude and 24 hours at 20.000ft mission altitude thanks to its increased JP-8 fuel capacity (530 litters [around 445kg] vs. 400 litters on Block-A). The ANKA Block-B UAVs has a 17.5m wingspan, 8.6m long, 3.25m height and has a 1,700kg take-off weight. It can operate at a distance of up to 250km, using line-of-sight (LoS) data-link system the “Anka” Block-B, has 720lt of payload volume and 250 kg payload capacity. Meanwhile, According to SSM’s tweets issued on March 16 and April 8, 2018 TAI has delivered four (two in each) “Anka-S” UAVs to the Turkish Air Force (TurAF). As of April 8, 2018, the total number of “Anka-S” UAVs that entered into the service of the TurAF has reached six (under two “Anka-S” Systems). On October 25, 2013 TAI was awarded a US$290 Million contract by the SSM to deliver three “Anka-S” MALE UAV Systems with 10 aircraft (2+4+4), 12 Ground Control Stations and sufficient amount of radar based Automatic Take-Off & Landing Systems to be deployed two separate air bases to meet the requirements of the TurAF. Aselsan’s share (delivering a total of 14 [ including 4 spares] CATS FLIR payload and some avionics inculuding INS/GPS and radio systems) in this contract is valued at US$33.576 Million. Deliveries are expected to be completed in 2018. TAI will manufacture a total of 11 “Anka-S” UAVs and to deliver 10 of them to the TurAF. According to sources “Anka-S” UAVs of the TurAF currently deployed at “Anka-S” Squadron located at the TurAF’s 14th UAS Base Command in Batman Air Base. But there is a plan to establish a second “Anka-S” Squadron in near future. ANKA-S Operation Center (Operation, Simulator ad Training Centre [OSEM]) has been established at Eskisehir. According to images appeared on the SSM’s social media account “Anka-S” UAVs are equipped with StarSAFIRE 380 FLIR payload rather than Aselsan’s CATS FLIR. However, according to Aselsan only two Anka-S systems are equipped with StarSAFIRE 380 FLIR, remaining Anka-S UAVs are being equipped with CATS FLIR payload.